SuperKayce is a cosplayer, artist, gamer, and all around fan-girl from the Midwest! She began her journey into the convention world in 2009 when she attended her first Superman Celebration! Since then she has definitely expanded her knowledge of costume creation as well as the convention scene! Kayce has gone onto create over 35 costumes including Astrid, Dawnstar, Natsu, Robin, MegaMam' and many more! She attends around twenty cons per year and has been featured as a guest at more than 15 shows including Indiana Comic Con, Wizard World Chicago, Cincinnati Comic Expo, and Rocky Mountain Con! 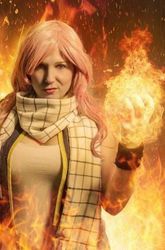 While Kayce has judged and hosted multiple cosplay events, she has also won several of her own awards and been featured in the 2015 issue of Icosplay Magazine! Kayce also uses her costuming by participating in many charitable events such Superheroes Fighting Cancer, SOSI, and Superhero Reading day at local libraries! She has also worked personally to raise money for Spina Bifida and needy families sponsored by The United Way Indiana!